I think it would be difficult to find a knife maker, knife collector or anyone who is interested in knives (especially custom hunting knives) that hasn’t heard of Bob Loveless. If you find a knife maker who hasn’t heard of R.W. Loveless I might be a bit skeptical. Cutlery Hall of Famer, father of the modern custom knife movement, the guy who popularized the dropped point skinner and more make up the legend of Bob Loveless. I mean the guy started making knives in the early 50’s when the only other person really making knives was Bo Randall. It’s always like that, the guys who were doing it first are always the legends in any certain field and rightfully so. Anyhow, I’ve read just about book there is on knife making and I finally made my way to this one. Most knife making books are extremely dry and boring. They go over the same systems and methods every other book does and there’s lots of repitition. Also, they typically tell you how to make a knife with extremely primitive tools so the average guy can make a knife in his garage with a file, drill press, hammer, a bar of steel and whatever else that is probably already in a DIYer’s garage. 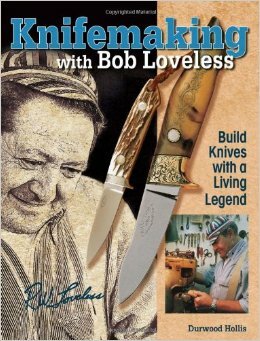 This book is no exception, except it tells you how Bob made his knives. Which is insightful and more entertaining. The first part of the book was most interesting to me as it detailed Bob’s early life, how he got started in knife making and his overall theory on knife making. At this point in my knife making it is theory that most interests me. The “why” behind certain methods instead of the method itself. The interview portion of the book revealed some true nuggets of wisdom that I’ve already begun to employ in my everyday knife making routine. I have a lot more respect for Bob Loveless after reading this book. He’s dead know as he died Sept. 2, 2010, but seemed like a really cool guy. And there’s plenty of these peppered throughout the book. There’s also lots of high quality color photos of his knives that let’s you inspect the detail of his knives. I’ve never seen a Bob Loveless knife, but I hope I do one day. I’d like to hold one. They’ve sold for $250,000 and the price isn’t going down on his knives, so it’s unlikely someone is going to just hand over a knife like that and let me fiddle with it. Overall, this was a refreshing read from the other knife books I’ve read. I’m also fairly certain I’ll be using this as a reference point down the road as well. Good one for the shelves if you plan on making any style of custom knife. You can order the book off of Amazon here.